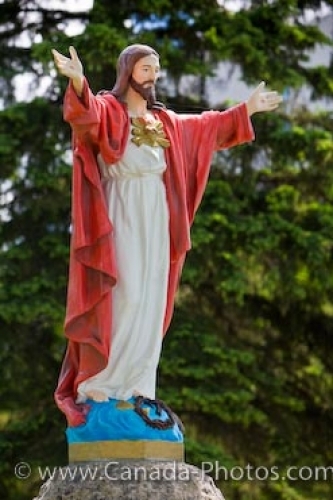 On the cemetery grounds at the St. Boniface Cathedral in St. Boniface in Winnipeg City, Manitoba, a colorful statue of Jesus has been erected. Adorned in a red cloak and mounted on blue pedestal atop a large rock, the statue of Jesus has become one that is photographed by many tourists visiting the cathedral. The cemetery is closed from dusk to dawn but those wanting to see the statue of Jesus after closing can easily view it from the outskirts of the cemetery. It is located on the east side of the cemetery at the St. Boniface Cathedral along Tache Avenue in the City of Winnipeg, Manitoba. Picture of a brightly colored statue of Jesus at the cemetery of St. Boniface Cathedral in Winnipeg. ... will find where early missionaries, explorers, settlers, Louis Riel and participants in the rebellion of 1869 have been laid to rest, all of which are watched over by the colorful statue of Jesus. Statue of Jesus in the cemetery grounds of the St Boniface Cathedral, St Boniface, City of Winnipeg, Manitoba, Canada.